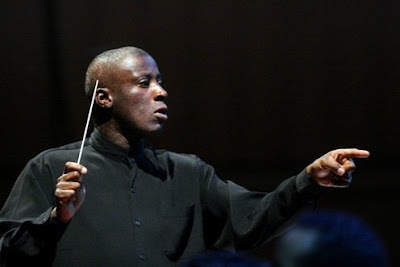 Wayne Marshall - seen above - has been appointed chief conductor of the WDR Radio Orchestra Cologne for an initial two year period. Organist as well as conductor, Wayne Marshall's impressive CV includes Gershwin's Porgy and Bess at the 1998 BBC Proms. He is one of just two black conductors to have appeared in 119 years at the Proms, the other is Bobby McFerrin who conducted the Vienna Philharmonic in 2003. The BBC spin machine generated a lot of coverage out of Marin Alsop breaking the gender barrier at the Last Night of the Proms, but the racial barrier still has to be broken. Wayne Marshall's appointment in Cologne is a very welcome step in the right direction. Also on Facebook and Twitter. Image credit Last FM. Any copyrighted material on these pages is included as "fair use", for the purpose of study, review or critical analysis only, and will be removed at the request of copyright owner(s). I greatly admire his playing and his conducting! As for breaking a color-barrier, what about Dean Dixon? I first saw Henry Lewis was with the LA Phil when his wife, Marilyn Horne, was still a soprano, James DePriest just died in February, and the very talented Kwamé Ryan conducts the orchestra in Bordeaux, There is also Thomas Wilkins who has an active career, and possibly the most talented of them all, Calvin Simmons. His passion and ability to engage the orchestra made him destined for great things. He died at an early age in a boating accident.